Born the son of a famous Hollywood actor, Buck grew up on movie sets, watching his father, celebrated actor Dub Taylor, appear with such movie greats as John Wayne, Tex Ritter and Bob Wills and the Texas Playboys. He initially took a different path, studying art at the University of Southern California, and, in 1960, trying out for the U. S. Olympic Gymnastic Team with the sponsorship of the cowboy actor Big Boy Williams. But the acting profession came calling. It was deeply rooted in the young man, who, after all, had actor Chill Wills help him take his first steps as a baby. Buck began his acting career in the fifties working in television. He appeared in everything from the Adventures of Ozzie and Harriet and My Favorite Martian to the classic period westerns, including Have Gun Will Travel with Richard Boone, The Rebel with Nick Adams and Bonanza. He is best remembered for his eight-year run as Newly on Gunsmoke, which ended in 1975. Buck appeared in other popular shows including Wagon Train, The Virginian, Dallas, and Walker, Texas Ranger. 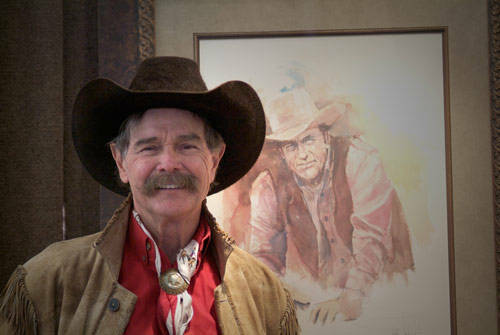 Preserving and celebrating the heritage of the American West is the driving force behind Buck’s career as a watercolor artist. With an artistic career spanning fifty years both on canvas and on the screen, Buck has garnered substantial acclaim. Recently Buck was inducted into the Texas Cowboy Hall of Fame and received the "Spirit of Texas Award.” Buck has lent his name and financial support to numerous charities including the John Wayne Cancer Foundation, the Walt Garrison MS Foundation, the FFA Scholarship Fund, the Screen Actors Retirement Home, the Ben Johnson Children’s Hospital and the Frontier Texas Museum.